Online technology dominates our era and eHealth has become a reality for sports clinicians and researchers. Contemporary online platforms enable self-monitoring and provide tailored feedback to the different stakeholders who play a role in the health and care of athletes. Innovations such as digital monitoring, mobile applications and connected hardware provide the critical tools to solve current enigmas in sports medicine research, and to streamline and facilitate injury prevention, management and rehabilitation. eHealth is not an emerging future of sports medicine—the technology to move our field forward in terms of research and practice is already available. This Analysis is based on Evert Verhagen's keynote presentation at the IOC World Conference on Injury and Illness Prevention in Sport (Monaco, 12 April 2014). It outlines the use of eHealth in research, implementation and practice, and provides an overview of possibilities and opportunities that existing and emerging eHealth solutions provide for sports and exercise medicine and physiotherapy. eHealth is defined by the WHO as “the practice of medicine and public health supported by electronic processes and communication’.6 This does not necessarily imply an interaction between humans and computers. We have been practising eHealth longer than we think. By this definition, a simple telephone consultation can already be regarded as an eHealth intervention. However, if truth be told, things become much more interesting with the wide-scale availability of smaller devices packing a punch of computing power, and the availability of online communication platforms. This is where the term ‘mHealth’ comes in; it refers to nothing more than the application of eHealth via portable (mobile) devices. Also, up and coming is the use of social media in this regard, for which no official abbreviation exists. Nonetheless, all these terms apply to the same electronic and technological developments and the way we interact with contemporary technologies. As such, in general, one simply uses the term eHealth to refer to any of the technological uses outlined above. This manuscript will give an overview of the possibilities and opportunities that existing and emerging eHealth solutions provide for research, implementation and practice in the broad field of sports medicine. Recently, Grindem et al9 investigated the reliability of an online activity survey to prospectively record the monthly participation in all sports relevant to a patient group of athletes recovering from an ACL reconstruction. Their study exhibited the benefits of the use of online questionnaires in clinical practice and research. They found that, next to being a reliable method to capture sports participation, the survey provided more complete data than a routine ‘paper’ activity questionnaire. Respondents enter data directly into a database. This eliminates manual data entry by researchers, increasing efficiency and data fidelity. Data fields can be predefined to contain only a specific range of possibilities, eliminating erroneous and out-of-range data. Respondents may receive notice when questions are skipped, reducing the amount of missing data. Through branching of questions (ie, guiding respondents through a questionnaire based on their answers), the time burden for participants is minimised through which the likelihood of continued study participation is increased. Recent developments such as outlined above may suggest that we have found the Holy Grail for epidemiological research. Nonetheless, there are a number of drawbacks. First of all, there is the concern that eHealth tools only reach a ‘digitally-literate’ population.15 Arguably, this may become less and less of a problem, whereas digital access and digital literacy continues to mature.16 Nonetheless, a residual issue is that different populations—or even subgroups within a population—use technology for different chores and in different ways, for example, adolescents versus adults.17 ,18 This implies that we have to attune our methodology or approach to our target audience. Also, validity issues continue to pose a reason for concern.19 Often, what happens is that a traditional ‘paper’ questionnaire is simply digitised, neglecting the fact that text is read differently onscreen than on paper. Onscreen reading is defined by short and concise text, while paper reading allows for longer paragraphs.20–22 Finally, through branching, the interpretation of some questions may get lost while a subset of questions remains hidden for the respondent after a specific answer. Answers to contemporary sports medicine enigmas? Despite the apparent disadvantages, which for the most part can be dealt with, there are many interesting things one can do with the readily available technologies. As an example, data collected through mobile and online technologies can be obtained remotely in large quantities and large populations (big data). It is even possible to collect data in real time that can be used, for instance, to adapt a treatment protocol based on (daily) patient reported clinical outcomes. Additionally, from a research perspective, continuous monitoring can be used for real-time predictive modelling. Longitudinal changes in predisposing injury factors can be charted, which would allow for a better understanding of the multifactorial and dynamic nature of injury risk. This in turn may be of specific interest for research on overtraining, injuries without a clear onset, injury exacerbations and recurrences. Social media is the means of interactions among individuals in which they create, share and exchange information and ideas in virtual communities and networks.23 Most are likely aware of the mainstream Social media platforms (eg, Twitter, Facebook, WhatsApp, Linkedin, ResearchGate, etc), but there are many more, each with their own services and own group of users. In essence, all of these networks provide the same mode of interaction (figure 1). In regular media, like this manuscript, there is a sender and there are receivers. A single message is sent to all receivers; we wrote this text and you are reading this. Social media, in contrast, facilitates and thrives on interaction. Again, there is a sender and there are receivers, but now the sender will only target a few receivers. Receivers will then share the initial message within their social networks and chatter starts. This process can be efficiently used for the dissemination of scientific knowledge to the field. 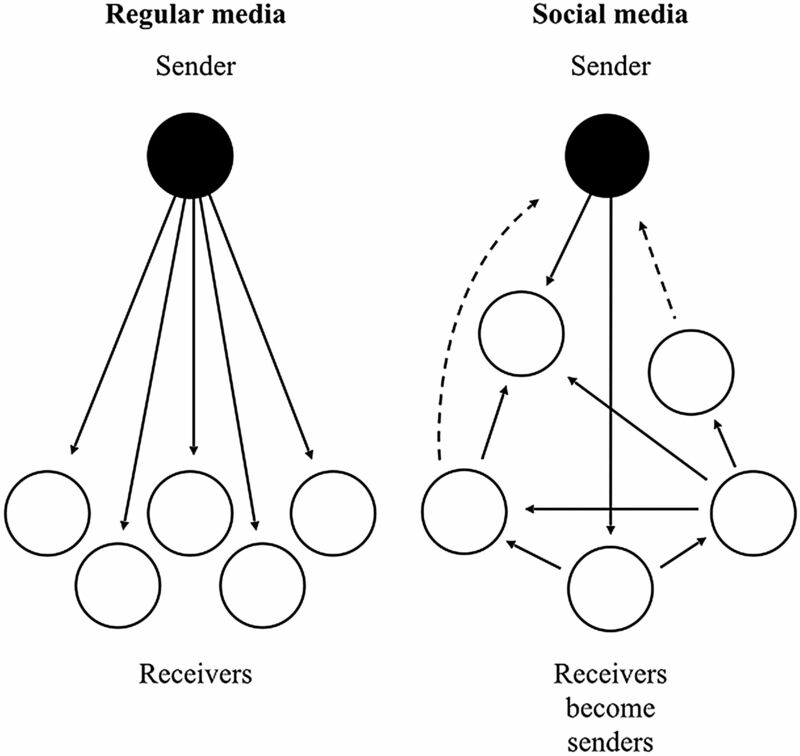 Graphical depiction of communication through regular media and social media. The use of social media is also embraced by the BJSM, and is integrated in the journal's strategy to disseminate quality content, promote member society information and listen to the clinical sports medicine community.24 The journal's website is for instance integrated with the BJSM blog, podcasts, Facebook and Twitter. There has to be an initial boost to gain attention (eg, seeding, buying views or sharing with Facebook fans). The main strength of social media is, at the same time, also the primary drawback. Content shared is open for anyone to see. As such, social media's use is limited when dealing with patients, athletes and research information.30 Even when clinicians and researchers are aware of privacy issues, it should be considered that users could be negligent and unknowingly share delicate information in an open environment. Additionally, one must not forget that social media platforms, and some Apps too, are commercial products that make revenue by sharing users’ information for commercial and marketing purposes. Apart from issues around the sharing of sensitive information, this may pose issues for, for instance, informed consent in research. A participant may have consented to participate in a study, but has not consented for commercial use of their information by a third party. Not being too pessimistic, specifically for research purposes, the open nature of social media can also be used to our advantage. In essence, we have access to a global and freely accessible ecological research cohort. This use of social media in sports medicine is illustrated by a cluster of recent studies on concussion.30–35 Sullivan et al34 investigated Twitter traffic over a 7-day period (July 2010) using eight concussion-related search terms. A total of 3488 unique tweets were identified, recognising social media as a powerful broadcast medium for information and education in relation to sports medicine. However, at the same time, there is a dearth of quality-controlled information available on social media. Williams et al,31 for instance, identified and classified the content of concussion-related videos available on YouTube. It was found that news and media organisations were the predominant source of concussion-related videos, with very few being uploaded by professional or academic organisations. Social media, if approached correctly, provides at many levels a wealth of new opportunities for the field of sports medicine. There is not always a need to develop Apps to aid clinical practice. One can use Apps that are readily out there and used by the masses. WhatsApp may be a good example, a free messaging service that uses your phone's data connection.44 It provides a cheap and efficient way to transfer messages, pictures, sounds and videos. WhatsApp delivers a very resourceful tool for communications in athlete care, for example, between therapists and athletes. Athletes’ reactions to rehabilitation exercises can be tracked and adapted where and when needed. Therapists can stay up to date and provide feedback on present or new injuries while athletes are away. In group-chats among a team of therapists, an entire team can share expertise and stay up to date with the health of their athletes. We just want to point out that services like WhatsApp can be used effectively in athlete care in which providing ethics around the sharing of medical information is dealt with accordingly, but the centre of this example is human interaction. New approaches in athlete care, in which Telecare replaces the physical contact with a therapist, are positioned in practice. They are mostly targeted at the masses and amateur athletes. These are disturbing developments. Patients do not physically see their therapist anymore, and all care from diagnosis to rehabilitation is provided via electronic communications. Certainly, this may lead to efficiency in care processes, but in our opinion a patient requires a proper physical examination. Such from-a-distance-approaches are, in our opinion, cash cows predatory to the eHealth hype. So far, this manuscript discussed eHealth technologies as stand-alone solutions in sports medicine. 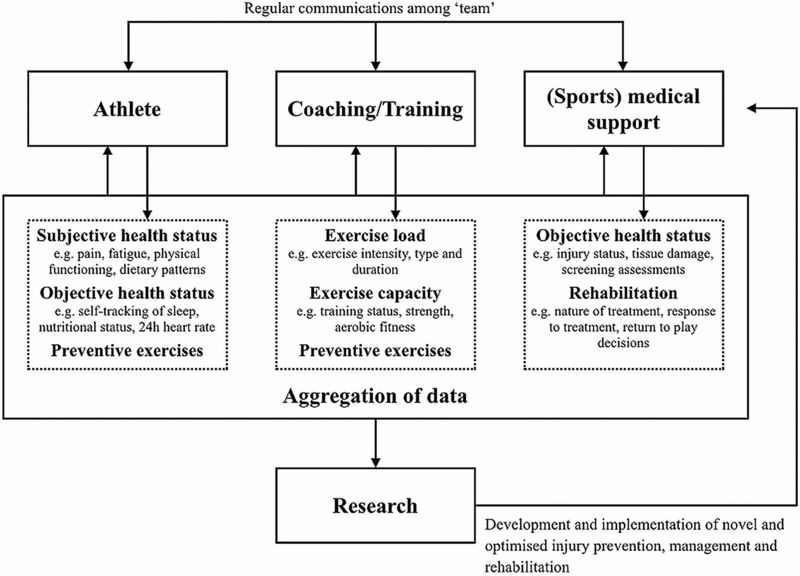 With the available tools, it is possible to provide an integrated approach that encapsulates all the sports medicine aspects outlined above: research, implementation and care (figure 2). During a season, a variety of information may be obtained from an athlete or a group of athletes, ranging from preseason assessments through to injury reports and subsequent injury follow-up. When this information is digitised and centrally stored, it becomes accessible for the entire athlete's (medical) support team for review and support of decisions. Even further, such a system could also provide tailored feedback in a clear and understandable way for the athlete and coaches. In this process, it is possible to provide team members with specific information that applies to their role in the health of the athlete, facilitating their regular communications among each other and further improving the performance and health of the athlete. An integrated eHealth approach that encapsulates various performance and health aspects in sports. Athletes, coaches and medical support feed information to a ‘system’. Information is aggregated and available for members, tailored to their need. Research can access the aggregated (big) data for research and optimisation of care. Such an integrated approach provides us with the scientific tools to solve current enigmas in sports medicine research, with an opportunity to learn our target audience better and engage them in injury prevention, management and rehabilitation, and with practical solutions to streamline and optimise injury prevention, management and rehabilitation. This should not just be the future of sports medicine; the technology to move our field forward in terms of research and practice is readily available. We just need to grasp this potential to propel our field into a new era. The authors would like to thank ACRISP. ACRISP is one of the International Research Centres for Prevention of Injury and Protection of Athlete Health supported by the International Olympic Committee (IOC). Global Internet Usage. http://en.wikipedia.org/wiki/Global_Internet_usage (accessed 12 Sept 2014). Global ICT Developments. http://www.itu.int/en/ITU-D/Statistics/Pages/facts/default.aspx (accessed 12 Sept 2014). Global mobile statistics 2014 Part A: mobile subscribers; handset market share; mobile operators. http://mobiforge.com/research-analysis/global-mobile-statistics-2014-part-a-mobile-subscribers-handset-market-share-mobile-operators?mT (accessed 12 Sept 2014). Leading social networks worldwide as of June 2014, ranked by number of active users (in millions). http://www.statista.com/statistics/272014/global-social-networks-ranked-by-number-of-users/ (accessed 12 Sept 2014). E-Health. http://www.who.int/topics/ehealth/en/ (accessed 12 Sept 2014).
. Smartphone and tablet apps for concussion road warriors (team clinicians): a systematic review for practical users. Br J Sports Med 2015;49:499505. What Are the Benefits of Texting Vs. Email? http://science.opposingviews.com/benefits-texting-vs-email-3872.html (accessed 12 Sept 2014). Digital Literacy Fundamentals. http://mediasmarts.ca/digital-media-literacy-fundamentals/digital-literacy-fundamentals (accessed 12 Sept 2014). Generations: Internet and Technology Use. http://www.ipsos-mori-generations.com/Internet-and-Technology-Use (accessed 12 Sept 2014). How 3 Different Generations Use The Internet. http://edudemic.com/kids-of-the-past-vs-today-infographic/ (accessed 12 Sept 2014).
. The Reading Brain in the Digital Age: The Science of Paper versus Screens. http://www.scientificamerican.com/article/reading-paper-screens/ (accessed 12 Sept 2014).
. Internet survey design. In: Fielding NG, Lee RM, Blank G, eds. The SAGE handbook of online research methods. 1st edn. Londen: Sage Publications, 2008:217–35.
. Internet, mail, and mixed-mode surveys: the tailored design method. Hoboken, NJ: John Wiley & Sons, Inc., 2007:1–15. Social Media. http://en.wikipedia.org/wiki/Social_media (accessed 12 Sept 2014). Nielsen. What Do We Do Online? How Much Time Are We Spending Online In Different Activities? http://www.nielsen.com/us/en/insights/news/2010/what-americans-do-online-social-media-and-games-dominate-activity.html (accessed 12 Sept 2014). Viral Marketing. http://en.wikipedia.org/wiki/Viral_marketing (accessed 12 Sept 2014).
. Exploring the opinions and perspectives of general practitioners towards the use of social networking sites for concussion management. J Prim Health Care 2013;5:36–42. Global smartphone penetration to jump 25% in 2014, led by Asia-Pacific. http://www.fiercewireless.com/story/report-global-smartphone-penetration-jump-25-2014-led-asia-pacific/2014-06-11 (accessed 12 Sept 2014). List of countries by smartphone penetration. http://en.wikipedia.org/wiki/List_of_countries_by_smartphone_penetration (accessed 12 Sept 2014). Smartphones account for just 27% of all mobile phones worldwide. http://thenextweb.com/mobile/2011/11/29/report-smartphones-account-for-just-27-of-all-mobile-phones-worldwide/ (accessed 12 Sept 2014). The US Digital Consumer Report. http://www.nielsen.com/us/en/insights/reports/2014/the-us-digital-consumer-report.html (accessed 12 Sept 2014).
. Many health apps are based on flimsy science at best, and they often do not work. http://www.washingtonpost.com/national/health-science/many-health-apps-are-based-on-flimsy-science-at-best-and-they-often-do-not-work/2012/11/12/11f2eb1e-0e37-11e2-bd1a-b868e65d57eb_story.html (accessed 12 Sept 2014).
. Healthcare's Tech Disconnect: why aren't we building the products patients really need? http://thehealthcareblog.com/blog/2013/10/11/healthcares-tech-disconnect-why-arent-we-building-the-products-patients-really-need/ (accessed 12 Sept 2014). Ankle for Android. http://www.androidpit.com/app/com.swigle.Ankle (accessed 12 Sept 2014). Ankle for iOS. https://itunes.apple.com/nl/app/ankle/id504536557?mt=8 (accessed 12 Sept 2014). WhatsApp. https://www.whatsapp.com (accessed 12 Sept 2014). Contributors EV and CB contributed equally to the conception and writing of this manuscript. Competing interests EV is the developer of the Ankle App, which is a not-for-profit application. EV is an associate editor of the BJSM. 50 years for the Netherlands Association of Sports Medicine (VSG) and counting!